There is a lot of noise in the press these days about folk who have Quit Sugar for a bunch of reasons, most of which are as much engaging fictions as they are fact. My reason was much more fundamental – biochemistry. Sugar, has many names – as a nutritional ingredient that you might see in the ingredient panel of your food it has at least 56 of them. But chemically they are all just different combinations of 3 simple sugars – Glucose, Fructose, and Galactose. 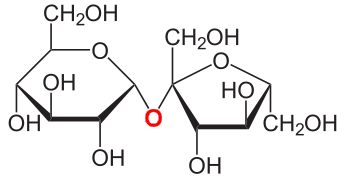 I’m going to discuss a 2 sugar molecule (disaccharide) called Sucrose, and you’ll likely know it as regular Table sugar (although you know I have quit all sugars, including starches). See that red Oxygen in the middle, well to it’s left is a 6 sided ring which is a glucose, and to it’s right is a 5 sided ring which is a Fructose. Pretty much the first thing that happens when that table sugar hits my gut, is an enzyme called Sucrase cuts it into it’s 2 component sugars – and then each is metabolized in a different way by my body. Glucose in my food is absorbed straight from my gut into my blood. Too much or too little is a bad thing so my body will do anything it can to keep glucose in my blood at a safe level. In someone with a healthy Glucose metabolism, when the red line (Glucose) goes up after a meal the blue line (Insulin) also goes up. Tells muscle cells to burn Glucose and store some in their short term fuel tanks (Glycogen). Tells the liver to make triglycerides (fat) from the Glucose and put them into VLDL in the blood. Drives triglycerides from lipoproteins in your blood into your fat cells – and stops your fat cells from releasing any to ensure that every other cell in your body uses Glucose first for energy. It’s all about getting the Glucose in the blood back down to safe levels. In a normal person Insulin quickly brings that Glucose down to safe level, and then Insulin can go back down to almost nothing after about 3 hours. Once Insulin comes down fat cells can go back to releasing stored energy to fuel the body in between meals. What happens for someone like me who is insulin resistant is my muscle cells have become resistant to the insulin. 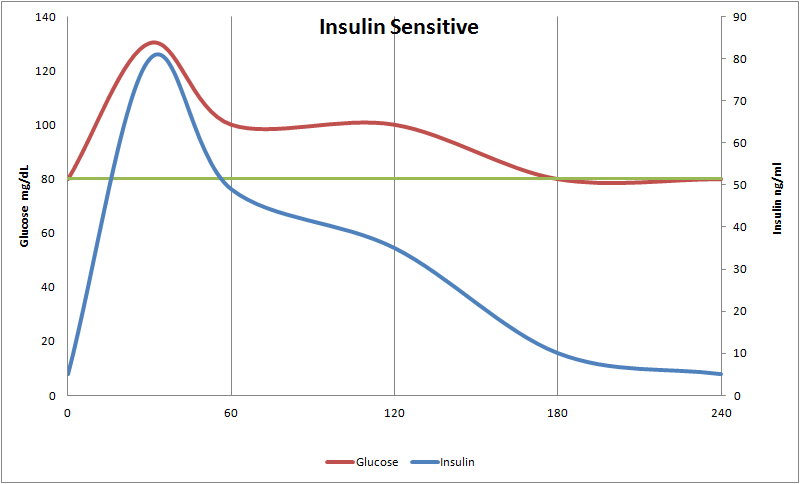 My Pancreas sees the Glucose and make some Insulin – that’s the first little peak in the blue line. 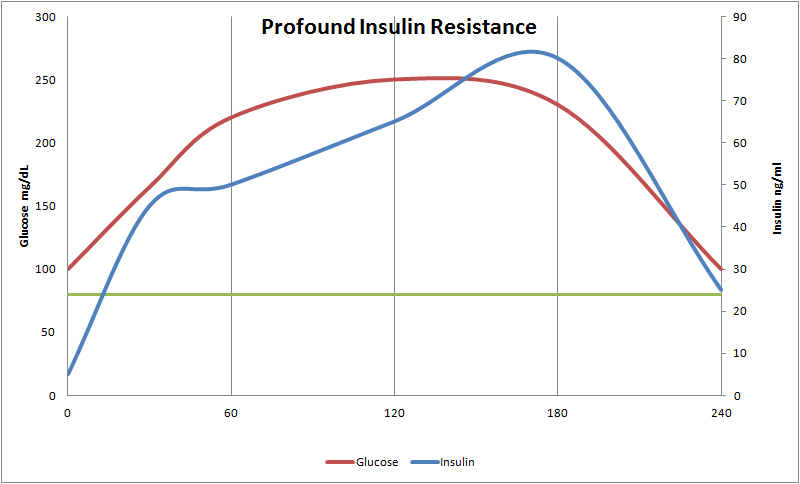 My muscle cells ignore that Insulin – that’s the Insulin resistance. My Liver sees the Insulin and turns a little Glucose into Triglycerides(Fat). My Pancreas sees there’s still too much Glucose in my blood so it starts making more Insulin. My Muscle cells are still not paying attention. My Liver still sees the Insulin and turns a little bit more Glucose into Triglycerides. Eventually 4+ hours later my liver clears enough of the Glucose to get to safe levels, and my Insulin level starts to drop. People who get full blown Type 2 Diabetes eventually can’t get their Blood glucose down to safe levels at all. Persistently High Blood glucose starts a nasty downhill slide involving blindness, ulcers, loss of feeling in the fingers and toes, and eventually if you are unlucky amputations. For those with pre-diabetes who can get their Glucose down – that persistently high level of triglycerides (because that is how your body is lowering Blood glucose) in your blood drives up your chance of getting Heart Disease. But even for someone who does not yet have pre-diabetic levels of Blood glucose but is a little bit Insulin resistant – you may still have prolonged high levels of Insulin and that has a big downside which I spoke of in “Why you get fat“. So remember there was that second half of Sucrose – Fructose gets absorbed into the blood just as quickly as Glucose, but it doesn’t cause an Insulin response. This is why Diabetics are often told they can have foods that are higher in Fructose like Agave Syrup or Honey because it doesn’t raise Insulin. The liver is the only organ that can actually metabolise Fructose. That metabolism provokes pathological Insulin resistance (Type 2 Diabetes), higher levels of Uric acid (Gout and High blood pressure) and hepatic steatosis (non alcoholic fatty liver disease) and the best discussion I know of about that process was given by Dr. Robert Lustig (UCSF School of Medicine, Pediatric Endocrinology). Dr. Lustig has 2 excellent presentations on the topic currently on Youtube and I suggest if you have the time it will be well worth your time to at least watch “Suger: The Bitter Truth”. A high level of Fructose is the environmental factor I was speaking of before that causes those 66% of humans who can become Insulin Resistant, more sick. The bottom line on Fructose is that it’s unique metabolism makes me more Insulin resistant which makes me much worse at dealing with Glucose. 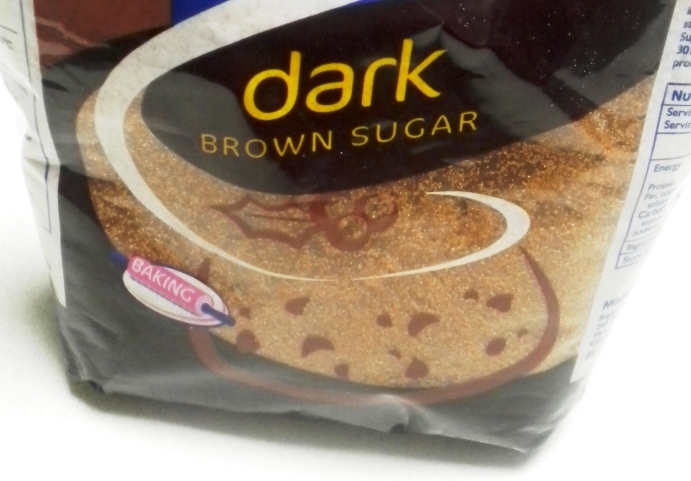 Dietary sugar, results in Dyslipidemia (High Triglycerides / High LDL / Low HDL) from all the Glucose being converted into Fat, Hypertension (High Blood pressure) thanks to the high levels of uric acid from the waste products of Fructose metabolism, as well as the direct problems of High levels of Glucose in the blood. Ever since I was diagnosed with pre-diabetes 10 years ago I had cut out most full sugar foods from my diet, nevertheless my blood glucose levels had slowly risen over time to unsafe levels so I determined to do something about it. Last May I got a blood test, and then I Quit Sugar completely from my diet. In August I got a second blood test and in November I got a third blood test. Now I have the comparison between what my diagnostic markers for disease look like when eating the lowish sugar diet I had been eating before and what they look like having not had ANY sugar for 5 months. My long term indicator of Blood Glucose control went from 7.5% to 5.2% which you would expect, but it is in my Blood pressure changes and Lipid panel that the most interesting changes occurred. 5 months after I Quit Sugar, my Triglycerides went from 233 mg/dl to 106 mg/dl, my HDL (good cholesterol) went from 29 mg/dl to 37 mg/dl, my Total Cholesterol went from 168 mg/dl to 142 mg/dl and my Systolic Blood pressure went from 149 mmHg to 109 mm Hg. There are all factors that the Framingham study identified as increasing the individual risk for a Heart attack in the next 10 years. My personal risk score went from a 7% chance of a heart attack in the next 10 years to a 2% chance – just by removing all sugar from my diet over 5 months.